Dialpad is a useful web application which helps you improvise and take your business communication to the next level. It enables you to communicate with your clients, employees and other businesses with utmost ease making your business communication more efficient and effective. Considering the modern market, Dialpad is a relatively new software but the progress that it has made is quite remarkable. With some highly useful integrations and scalable features, Dialpad has sought the attention of the most renowned brands in the world at present. Whether it is voice based communication or text messages, Dialpad has great solutions for them all. It takes your communication to a new level so that you also enjoy your time while speaking to your clients. Dialpad has a highly innovative phone system. It is quite crucial to make cross departmental communication simpler which is why, Dialpad enables your employees to connect with their colleagues. Having a unique phone system can be sometimes quite expensive but not with Dialpad. Affordability is one of the best features at Dialpad. To make sure that you can connect to your workers from anywhere, Dialpad helps you to make calls through Wi-Fi or other carriers. The quality of these calls is guaranteed so that there are no uncertainties during your communication. What’s more is that there is a video calling feature available too. This is a great addition because you can now provide technical assistance to your staff which might be present at remote locations. Another interesting feature is call switching. 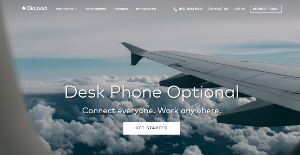 Whether you want to shift from one carrier to another or from your desktop to your tab or smart phone, you can do it all without interrupting any calls. To maximize your productivity, Dialpad has got some really useful integrations. These integrations help you to extract the valuable insights from your text and voice communication. This enables you to address to the problems and issues related to your business. Whether your employees use desktops or mobile devices, Dialpad enables you to communicate through SMS and chat. Group chats and personal messages are quite useful for shorter duration communications where you only wish to drop a message or inform your colleagues. Also, the chat info can be used at the time of reporting. Every business is different, and may need a particular type of Business Phone Systems solution that will be fit for their company size, type of customers and staff and even particular niche they support. You should not count on finding a perfect software that is going to be suitable for every business regardless of their history is. It may be a good idea to read a few Dialpad reviews first and even then you should pay attention to what the software is intended to do for your business and your staff. Do you require an easy and intuitive solution with just elementary features? Will you actually use the advanced functionalities required by experts and big enterprises? Are there any particular tools that are especially beneficial for the industry you work in? If you ask yourself these questions it will be much easier to locate a reliable service that will fit your budget. How Much Does Dialpad Cost? We realize that when you make a decision to buy Communications Software it’s important not only to see how experts evaluate it in their reviews, but also to find out if the real people and companies that buy it are actually satisfied with the product. That’s why we’ve created our behavior-based Customer Satisfaction Algorithm™ that gathers customer reviews, comments and Dialpad reviews across a wide range of social media sites. The data is then presented in an easy to digest form showing how many people had positive and negative experience with Dialpad. With that information at hand you should be equipped to make an informed buying decision that you won’t regret. What are Dialpad pricing details? What integrations are available for Dialpad? Pros: The web-based nature of Dialpad means users on any platform are treated equally. No longer do Mac users get hand me down or crippled features that other phone vendors tend to provide Mac users because the product treats users equally. It's also really nice to have users manage themselves because it is easy to set things up and configure the way they want it, with no administrator required. Cons: Updates come frequently bringing new features, but that also means updating apps and ensuring features are configured correctly on a normal basis. I really wish we could customize the desktop phones more and get more use out of the hardware. Also, some users are not onboard with software based phones and still want or require a desk handset. Being able to utilize the full features available to the hardware buttons would be nice. Pros: Call quality is good just like a landline. However calls take too long to ring on the remote phone causing inefficiency. Cons: We are a recent customer of dialpad - we found two things which I would like to share with others 1)Their user interface is very difficult to use – so difficult that we had to delay launch of our sales campaign. 2) They have no live support – no live chat, no live phone – this adds to the above problem of having a difficult interface. Call quality is good just like a landline. However calls take too long to ring on the remote phone causing inefficiency. If you need more information about Dialpad or you simply have a question let us know what you need and we’ll forward your request directly to the vendor.